16 1/8 by 13 in. 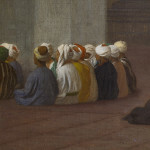 The present picture, unseen for over half a century, may be considered a leading example of the illustrious series of paintings Gerome made in the 1860s depicting Muslim men at prayer. In the 1860s, Gérôme began one of his most successful Orientalist series, depicting Muslim men at prayer. 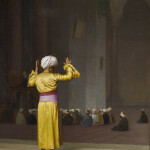 Set outdoors, on rooftops, and inside mosques, madrasas, and other religious and domestic structures throughout the Middle East, these meditative images became virtually synonymous with the artist’s name, and are today among the most coveted images in Gérôme’s expansive oeuvre. The present picture, believed lost for over a decade, is a leading example of this illustrious group. Gérôme’s intense interest in the art and architecture of Islam, and its pervasive influence on Middle Eastern daily life, is evidenced by the numerous architectural and ethnographic sketches he made abroad and by the calculated itineraries he followed, particularly in Egypt and in Turkey. (Gérôme also accumulated an extensive library of photographs and souvenirs during the 1860s, 70s, and 80s, which he used to create compelling images in his Paris studio, even decades after his travels had ended.) 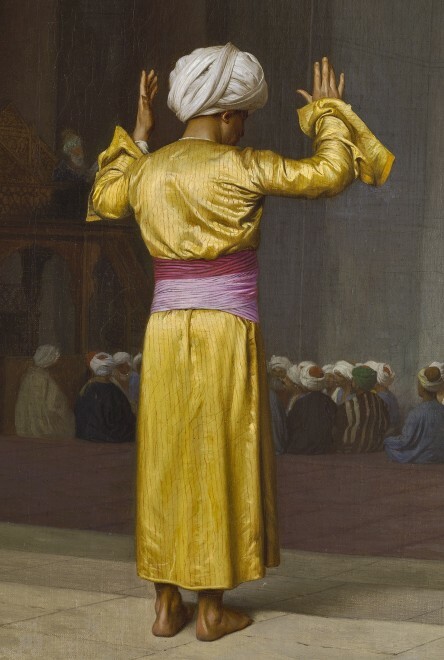 In Istanbul in 1875, Gérôme visited at least fifteen mosques as a guest of the Sultan, his celebrity allowing him unprecedented access to the city’s foremost religious and historic sites. Among Gérôme’s favorite mosques were the New Mosque (Mosque of the Valide Sultan), the Sultan Ahmet (Blue) Mosque, and Rüstem Pasha, all of which were featured in whole or in part in subsequent pictures. Hagia Sophia, arguably Istanbul’s most popular attraction among nineteenth-century travellers and artists, must have been influential as well. In the present work, the Ottoman tughra (medallions filled with the sultans’ calligraphic monograms) recall the interior decorative schemes of this awesome site, as do the columns and arcades in the background. 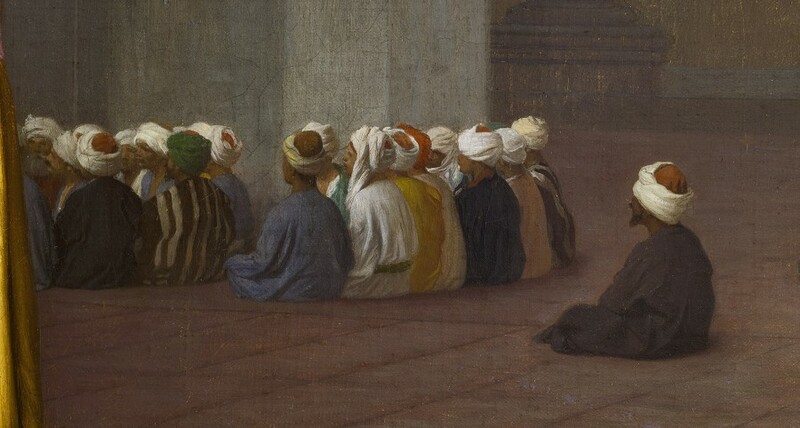 Prière dans la mosquée features additional figurative and formal elements for which Gérôme’s Orientalist works were best known. A single figure stands silhouetted against a darkened yet architecturally distinctive backdrop, his silken robes crafted from the most vibrant of confectionery colors. He raises his hands, palms facing outward, as if to recite “Allah-o-Akbar” (“God is Great”). This expressive gesture was part of the prayer ritual, and was usually made during Qiyam. 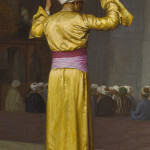 (Gérôme derived the postures of his praying figures from a litany of sources, including the published works of such renowned Orientalist scholars as the British ethnographer Edward William Lane.) The man’s back is turned to the viewer – an unusual conceit that Gérôme had considered and abandoned in at least one other of his prayer paintings, as contemporary documents attest. 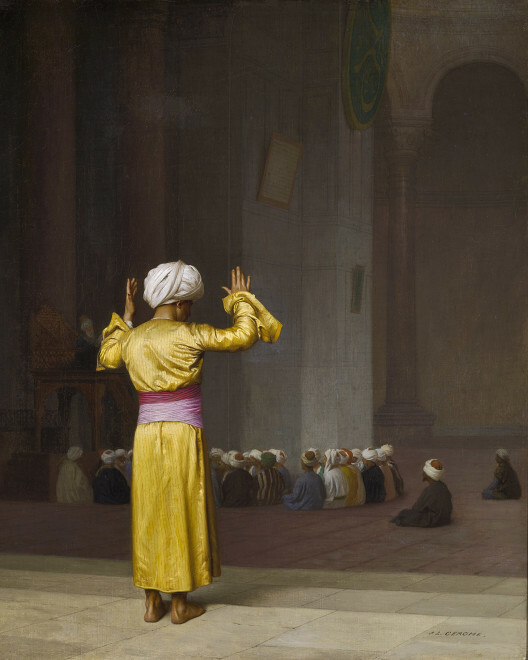 In a letter to the dealer Knoedler, Gérôme explained: “Prayer in the Mosque had been reserved by Monsieur Simon and I remember that he made me put a figure facing the spectator, by saying that since all the others were seen from the back or in profile, it would not sell. I did as he wanted because his reasons were commercially sound,” (Letter to Knoedler, 8 June 1903, Custodia foundation, Fritz Lugt collection, Netherlands Institute, Paris). The artist’s decision to risk the vagaries of the art market and forego a frontal view has here the added consequence of challenging the very tenets of the Islamic faith: the fact that the standing figure does not face the intricately carved wooden minbar, as do the other seated Arabs who listen intently to the oral delivery of the Friday sermon, removes Gérôme’s painting from the world of rote or ethnographic documentation and elevates it to a distinctly creative art. This catalogue note was written by Dr. Emily M. Weeks.